Yippee! 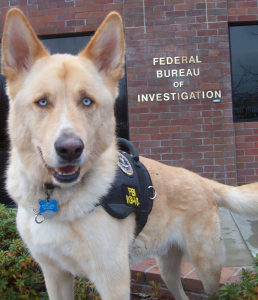 Thank you FBI and thank you to my personal pet psychic Alissa Wolf for posting this on her blog Critter Corner. In a development that animal welfare advocates and animal lovers in general applaud, the FBI recently announced that the bureau will now classify animal cruelty as a Class A felony, in the same league as homicide, arson and assault. Extensive studies have indicated that many mass murderers, such as Jeffrey Dahmer and David “Son of Sam” Berkowitz, initially abused animals as children. Thus, the new classification will enable law enforcement officials and mental health counselors to keep better track of kids who show early signs of trouble, in an effort to help thwart any criminal activities on their parts later in life. This will also enable the FBI to monitor animal abusers nationwide, and will help to strengthen individual state laws pertaining to this.